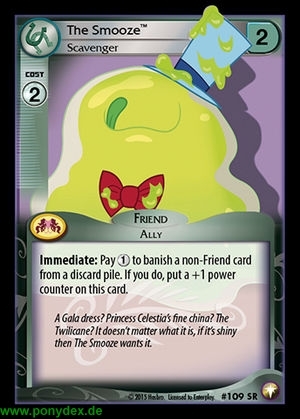 Immediate: Pay 1 action token to banish a non-Friend card from a discard pile. If you do, put a +1 power counter on this card. A Gala dress? Princess Celestia's fine china? The Twilicane? It doesn't matter what it is, if it's shiny then The Smooze wants it.